George Washington image: Wikimedia Commons. Located in the in the under-the-radar Rockland County celebrity enclave of Snedens Landing, this 18th century stone house, home of landscape designer and photographer Judy Tompkins for 60 years until she passed away at age 90 last May is rumored to have served as George Washington’s office when his men were guarding the ferry service from the cliffs of the Palisades. 6sqft previously noted the home’s rich history, beautiful interiors, and gorgeous perennial gardens created and tended by Tomkins, when the property hit the market last summer for $1.6 million. Now, the New York Post reports that the home has sold for its full asking price. 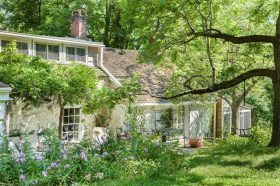 This 18th century stone house, located in the upscale area of the Palisades known as Snedens Landing, was under the care of the landscape designer and photographer Judy Tompkins for some 60 years until she passed away at age 90 this May. 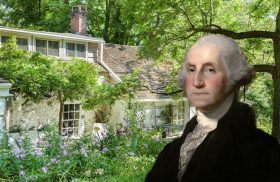 But long before, it’s rumored the property served as George Washington’s office when his men were guarding the ferry service from the cliffs of the Palisades. With a rich history, beautiful interiors, and gorgeous perennial gardens tended to by Tomkins, it’s a special offering in a town right outside New York City. And it’s now asking $1.6 million.